Let's Help Save The Grand Farm! Together, we have the opportunity to be a part of building legacies of love. Let's live, love, and GIVE with purpose! "Go help all the sweet peeps by buying this farm! I love you so much!" "Happy to be a part of the change!!" Friends! Most likely you're here because you just listened to our Twirl Talk Podcast episode with Ben Higgins and want to be a part of the amazing work he's doing with his friends at Humanity & Hope United! Through the month of December we are helping fundraise as much money as possible to help H&H save Grand Farm. What is Grand Farm you may ask? Learn all about it HERE or watch the video below! 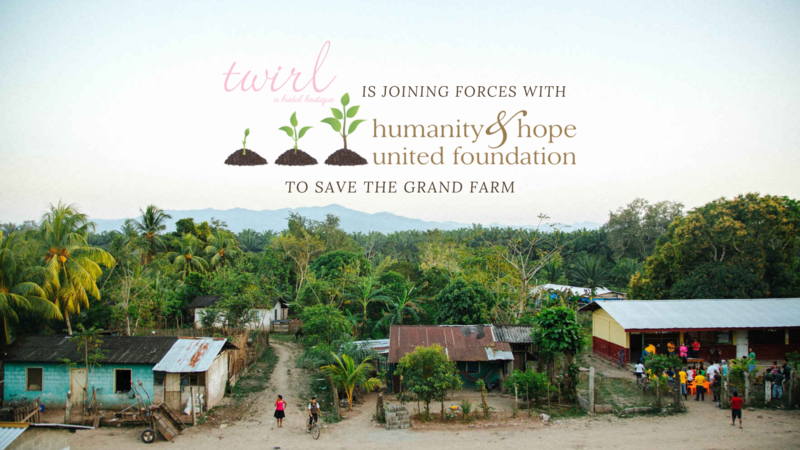 Join the Twirl Family in supporting real change. Let's support good in the world and make a difference. Please consider making an investment in the Grand Farm to continue to allow the people in La Coroza discover their greatness and for their dreams to continue to grow. We believe in the future of the 126 people in La Coroza and have seen them prosper over the last 5 years. Let's make sure the people of La Coroza always have the opportunity to invest in making their own dreams come true! I wanted to do something good and make the world a better place. When I found out that The Grand Farm in La Coroza is up for sale and that Humanity and Hope has the option to purchase it for their community, I knew I wanted to be part of it. This land supports the future of a whole community. A large company could buy it if we don't. The Grand Farm is 30 acres of land used for farming corn, beans, and plantains; and, it sits in the midst of thousands of acres of African Palm. Palm companies are constantly looking to expand, and the owner of this property has committed to selling to a palm company if we are not able to buy it. As far as jobs go, it's an oasis in the desert because the Palm doesn't provide much work. That's why I created a fundraiser to support Humanity and Hope's campaign to Purchase the Grand Farm. Since 2015, the Grand Farm has served as the bedrock of La Coroza. It has literally made dreams come true, and help new dreams grow. Since the Grand Farm began offering employment to anyone who needed it, the village has undergone a transformation: 100% employment among men AND women wanting to work, nearly 30 men and women working daily in H&H funded businesses. School enrollment doubled and now 40 children go to school every day. La Coroza has gotten clean water and electricity and because they have jobs, they have the ability to pay for it. The first generation ever is attending high school. Everyone in the community owns their own home and the entire community feels unity, and an intense hope for the future. Please consider making an investment in the Grand Farm to continue to allow the people in La Coroza discover their greatness and for their dreams to continue to grow. We believe in the future of the 126 people in La Coroza and have seen them prosper over the last 5 years. Let's make sure the people of La Coroza always have the opportunity to invest in making their own dreams come true!—and you can be a part of it. Thank you for supporting our Field of Dreams! Thank you so much for your generous donation to my fundraising campaign for HUMANITY AND HOPE UNITED FOUNDATION INC. Because of you, we'll be able to purchase The Grand Farm for La Coroza. Your support will go a long way in helping us reach our goal. I'll keep you posted on our progress. In the meantime, I recommend that you check out HUMANITY AND HOPE UNITED FOUNDATION INC. They're doing great work.